Published September 1988 by Longman . PUBLISHER: Longman Group UK Ltd./ Ben and company limited. 2. Who is the writer of the book? 5. What do you see on the front cover? 6. What can you find in the blurb? (short description giving information about a book, new product etc). Mabala the farmer is one among the famous short stories ever written in Tanzania.This short story has seven chapters. The first chapter introduces Mabala as the Main character.The second talks about Mabala’s first day on the farm. The third chapter tells us that Mabala rests instead of working. The fourth chapter is set at the Mtama Bar where during drinking the mtama, Mabala is advised by the men that he was supposed to drink a little mtama early in the morning and at the farm if his body could start aching. Also if his head could ache he was advised to lay down for five minutes and soon all things could be ok. The fifth chapter talks about the hoe and the gallon can. It explains that Mabala was now in practices following what the men advised him. He drank the Mtama and could not afford to lift the hoe.Therefore he slept under the nearby mango tree and his wife informed him that he was a lazy man as he stayed a whole day without working. The sixth chapter is about Mabala and the fertilizer. Here, Mabala goes on showing how much he was stubborn because his wife Mama Martina advised him to carry the fertilizer half a bucket but he rejected and carried the whole bag and he was tired and some of the fertilizers had to fall down. At the end Mr. Sekulu (a neighbor) tells Mabala that it was sugar and not fertilizer but Mabala refused to agree until Mama Martina went back to the farm. Also Mabala seems not to follow the instructions of putting fertilizers on the maize plant and two rows dried because of poor way of putting fertilizers. The last chapter (chapter seven) is about Mabala’s winning respect. Within this chapter Mabala become a village accountant and he works effectively. One of the shop assistants had to run away because he realized that Mabala would catch him. They harvested together and it was good harvest. Also Mabala agreed that he had learn a lesson and asked his wife whether he could join the shamba work. Therefore, going to the village was a fortune to Mabala and his family. Martina was now nine years old and they were expecting to have another child. Lastly there is a glossary words which have been used in the story. Generally speaking, the story “Mabala the Farmer” is about a man called Mabala who was born in Dares Salaam and spent all his life there. Mabala married to a woman called Mauja. Mauja has a daughter called Martina. Because of that, Mauja is now known as Mama Martina. Mabala has neither a house nor a shamba in Dar es Salaam. Although Mabala was working as a chief clerk in one of companies in Dar es Salaam, he could not save the money as he was extravagant. When the ideas of saving money come into Mabala’s mind it was too late because at that moment price went up and up. Mama Martina started to sell matis and chapatis but still life was tough. Mabala finally, gets an idea of leaving the city in order to try the rural/ village life therefore, he decide to go to the village to do the shamba work. At last, he leaves the city and starts life afresh in the village. There, he faces a lot of difficulties. This is mainly because Mabala does not know how to dig. He has never worked on the farm. Strangely, Mabala does not like to admit his weaknesses before other villagers. Thus why they called him Mr. Never told! Or Bwana haambiliki or stuborn. Mabala pretends to know everything. His wife Mama Martina uses much of her energy to make her husband cope with both village life and villagers. It takes time for Mabalato adapt, but at last he succeeds in making his life happier in the village. He engages himself in farming activities seriously after he became the village accountant. He view gets enough food which makes other villagers admire him. The villagers no longer laugh at him, mock or joke him as they used to do previously. They now appreciate and trust him. CHARACTERS AND CHARACTERIZATION IN MABALA THE FARMER. i) Characters- Refers to persons/ people or things in a book, play or film doing something. ii) Characterization-This means how the writer of the book, play or film describes/ makes a person or seemslike a real person. Ø He is a main character in the story. Ø He was born in Dar e salaam and married a woman called Mauja. Ø He is extravagant and he wants to live very luxurious life while his salary is not enough for that. The life in town becomes difficult and tough because he did not prepare his future. When he was still working he never built a house or made any other preparations that could help him in future. Ø He had a good heart because he was generous and helped others. Ø Mabala also never lived in a village. This means that he never cultivated a farm and he could not know how hard the work was. Ø In town he always listened to radio and read books. Ø He decides to leave the town in order to start life a fresh in the village. Ø He faces a lot of obstacles but at the end he manages to cope with village life. Ø His actions in the village make people laugh at him but his wife tries hard to make her husband cope with village life. Ø He is flexible. But he sometimes pretends to know more than he does. Ø He is selfish as he does not consider others. This seen when he eats all the food at the farm without considering his wife. Ø He is also stubborn as he never listened to any one. Thus why they call him Mr. Never told! Ø She is another main character of the story. Ø She is known as Mama Martina because her first born is called Martina. Ø She is the wife of Mabala and she has true love for her husband. Ø She is one among the few women who can tolerate life difficulties in their families. Ø She uses most of her time to make her husband Mabala cope with village life. Ø She works very hard to improve her family life. In town for instance she could sell matis and chapatis, at the village she worked very hard to the farm despite the laziness and ignorance of her husband. She seeks and follows good advice given by the villagers and Bwana shamba and thus why she got 60 bags of maize. 2. MINOR / MINIMAL CHARACTERS. Ø She is the daughter of Mabala and Mauja. Ø She is the only child in the family similar to her father Mabala. Ø She was born in Dar es Salaam. Ø She was educated in Morogoro village when her parents decided to live in the village. Ø She refused to go to school because her fellow pupils laughed at her as her father was stubborn. Ø She likes school because later on she continue with it after Mabala wins respect and become a village accountant. Ø A village who is not satisfied with what Mabala tries to explain about town life. Ø He is an old man who suggests that all the men in town want to drink beer and chase girls. Ø He is among the men who saw Mabala fast asleep under the tree while Mama Martina was working hard. Ø MzeeKombo and other men decide to teach Mabala a lesson after he insulted the men that were only drinking mtama and not working, Working was for women. So they advised Mabala to drink little mtama early in the morning, at the farm if the body could ache and he did so. Ø This is Mabala’s and Mauja’s neighbor. Ø He sees sugar on the ground and realizes that it is not fertilizer but sugar. Ø He is a good man because he decided to call Mabala and asked him why he was taking much sugar to the farm. But Mabala says it is not sugar but fertilizer. Ø He runs to Mama Martina and gave her the story. Mama Martina decides to follow her husband to prove that later on she assures Mabala that what he is carrying is not fertilizer but the sugar bought while they were in Dar es Salaam. Ø He said truthful to the villagers about the arguments between Mabala and Mama Martina on how to put fertilizer to the maize plants and soon the song of Mr. Never told / Bwana haambiliki started to be sang in the village by the villagers. § A theme is the main subject or idea in a piece of writing like books, play or film. § The main theme in the book MABALA THE FARMER is about Life in town and in the village. ˉ In this book, the author describes that life in town is very tough because things are sold in high price. For example, Mabala could not even save his salary because of life hardship. That’s why his wife Mama Martina decides to sell matis and chapatis in order to improve life but still life was becoming harder and harder. · LIFE IN THE VILLAGE. v This means lack of knowledge or information about something. 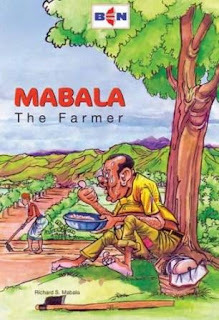 In the book, “Mabala the farmer” the author has used “Mabala” as a person who lacked knowledge on various things especially in farming activities. For example, Mabala was cheated by his friends at the Mtama bar that if he drinks Mtama early in the morning and drank it at the farm, he could work hard. v At chapter six, Mabala and the fertilizer, Mabala seems to lack information or knowledge because he put the fertilizer on the maize instead of putting it around the maize plant. v This means, working with a lot effort and determination. In this book, Mauja ( Mama Martina) is a hard working woman because in town she sells matis and chapatis to sustain life but in the village she worked on the farm alone in the beginning and got 60 bags of maize. v When her husband resigned the work in town and lived in the village, mama Martina worked hard even without eating and that’s why at chapter seven ( Mabala wins respect ), the harvest were more good. i)She prepares some food and water for her family. Example of food prepared are maize and beans, and porridge. ii) She gives advice to her husband on how to cope with life in the village and it was through her later on Mabala won respect. iii)She respected her husband and other neighbors in the village. Example, she received bad news from Sekulu that her husband carried sugar instead of fertilizers. It is a process of teaching and learning usually at school. In this book Mabala started primary school in Dar es Salaam and in 1961 the year of Independence of Tanzania he completed standard eight and was employed at UARAFIKI TEXTTILE INDUSTRY. Also Martina, the Mabala`s and Mauja`s daughter also was studying primary school to the village they shifted. To exploit means to treaty someone unfairly by asking them to do something for you, but giving them very little in return. In the book ‘Mabala the farmer’ Mabala is complaining on the salary he receives at his work place, he compared it like buying twenty bottles of beer. This means that he was exploited a lot by the company he does the work. Both in town and the village people drink Mtama. Mabala says that when he was at town he used to drink mtama and the mtama at the town was not sweet like that of the village. In this book Mabala and those men at mtama bar are discussed as drunkard people because they spent their time drinking without working. This hinder development in the society. v Refer to not liking work and physical activity. In the book ‘Mabala the farmer, Mabala has been used by the author as lazy person because he could drink mtama the whole day and could no longer work again in the shamba and what he could do was to eat all food and sleep at nearly mango tree. v Is the situation where somebody feels that he/ she is weak or shipped. In this book, humiliation is shown by Mabala to his wife mama Martina because mabala insults her by saying that women are always weak while men are strong and thus why they can work while drunkard. v Another humiliation is given by the villagers to Mabala’s family where all villagers were laughing at mabala, Mama martina and Martina. This was due to Mabala’s laziness to farming activities. v This is spending a lot of money for luxuries. In the book, Mabala used his salary in bad way. He could spend and spend without saving. This led him to run away from town to village. Selfish means caring about yourself and not about other people. In the book, Mabala is drawn as a selfish man because he was eating too much food to the farm without considering his wife mama Martina who was working the whole day without eating and Mabala finished all the food which where maize and beans. MESSAGE ( S ) FROM THE BOOK. The message we get from the book is that; life whether in town or village is not easy either. We should work hard in order to succeed. This is shown on chapter seven ( Mabala wins respect ) this is when Mabala shift his family to the village and get a lot of successes. i) Lazy people like Mabala never succeed in life until they work hard. ii) Drinking mtama doesn’t go together with working at the farm. iii) Agriculture is the backbone of our national development. iv) Working hard with aims / intentions is a key point of success. Eg mama Martina. GUIDING QUESTIONS FROM THE BOOK. Qn.1What is the physical and social setting of the book? The physical and social setting of the book is Tanzania especially Dar esSalaam when its still a very small town in the year of independence (1961). Socially, life in town is so tough because the price went up and up and there was no saving for future by Mabala because he used his salary (money) in bad ways (luxuries). Qn.2 How is the language used in the book? · In this book the language used is simple and direct. That’s why the book is well understood. Qn.3 Does the author deviate from the ordinary language use? i) The use of Kiswahili language. · Here, Kiswahili words like Mzee, Bwana shamba, Mama Martina, chapatis, Bwana haambiliki and others related words which are used in the book. This is shown that the author has deviated from using English words to Kiswahili words for clarity. a) “Once the water has been spilt you can’t pick it up again”. b) “if a child cries for a razor blade give it to him. He will learn. Qn.4 Which characters do you like most? Why?